Lockheed Martin Donates $500,000 To Girls Inc.
New York. September 29, 2014 – Earlier this month, Lockheed Martin donated $500,000 to Girls Inc. to strengthen its science, technology, engineering and math (STEM) programming for 500 girls ages 9-12. Lockheed Martin’s new financial commitment comes on the heels of a successful 2013 pilot program, which paired program participants with Lockheed Martin mentors at five Girls Inc. locations, including Denver, Colorado. At the conclusion of that program, girls reported increased interest in studying STEM, positive experiences with female role models and a heightened awareness that a STEM career is a good choice for girls. Building on the success of the pilot program, Girls Inc. will work with ten affiliates that will each offer multiple sessions of the 16 hour Science, Math and Relevant Technology (SMART) Partners program throughout the yearlong grant period. This new partnership will ensure that significantly more girls consider and are interested in pursuing STEM careers. During Girls Inc. programming, girls develop STEM skills through hands-on activities that allow them to ask questions, persist, and solve problems. By engaging with women and men pursuing STEM careers, girls begin to view these careers as exciting and realistic options for themselves. Although women have made substantial gains in the proportion of bachelor’s, master’s, and doctoral degrees earned in the STEM disciplines, substantial gender gaps remain. Girls continue to lag behind boys in course enrollment and advance placement exam participation, and in specific STEM subjects. Women currently earn 41% of PhD’s in STEM fields, but make up only 28% of tenure-track faculty in those fields. Women also fill close to half of all jobs in the U.S. economy, but hold less than 25 percent of STEM jobs. Contributing to the under-representation of women in these fields are persistent stereotypes that girls are not good at, or aren’t interested in, STEM subjects. Lockheed Martin and Girls Inc. are working hard to ensure that these stereotypes are broken and that other obstacles that prevent girls from pursuing STEM careers are removed. Lockheed Martin supports a wide-range of STEM activities that reach students and educators from elementary school through college. Through the Engineers in the Classroom STEM education outreach initiative, employees have opportunities to interact with the next generation of engineers and technologists by serving as school advisors, extracurricular activity mentors and career role models for students in communities where they live and work. 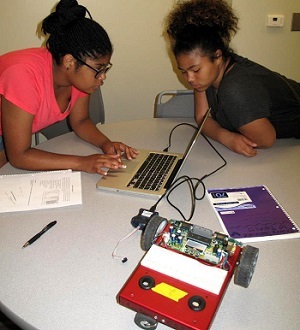 Lockheed Martin also partners with Project Lead the Way, the leading provider of pre-engineering K-12 curriculum, and works with organizations such as 4-H and FIRST Robotics, which allows employees to mentor students in afterschool Robotics Clubs. Its newest partnerships are with Girls Inc. and Great Minds in STEM.